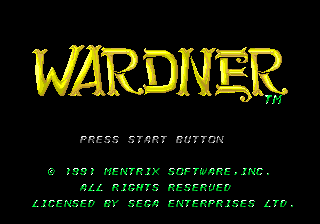 Wardner, called Wardner no Mori in Japan and Pyros in its initial North American release, is a 1987 arcade platformer by Toaplan. Visco ported it to the Sega Mega Drive in 1991, removing Toaplan's name and publishing it in Japan as Wardner no Mori Special (ワードナの森ＳＰＥＣＩＡＬ). They would then license it to Mentrix Software for publication in the US as Wardner. The later developed Gods by The Bitmap Brothers shares some elements with this game. A boy and a girl are wandering about when they get lost in the Forest of Wardner. Suddenly, a green spectre comes and kidnaps the girl, leaving the boy to find her. and jump. Jumping on vines will automatically latch you onto them to climb. crouches; you can jump while crouch and will need to do so to collect gold treasure, which serves as a currency. shoots fire to destroy enemies with. Defeated enemies drop money bags or orbs, which power up the main shot after you collected 15 of them. You lose a life with one hit, unless you collect a cape (absorbs one hit) or bought needle and yarn (absorbs another hit). The game has a total of 6 stages, all of which end with a shop where powerups may be purchased. By talking to the witch in stage 4, the timer will be reset. This can be abused to collect infinite score as certain enemies in this stage also reset. If this is also present in the Arcade version or not is currently unknown. The game has been remixed for the Mega Drive port: Stage 2 got a new boss (was a reused stage 1 boss). Stage 3 got the Arcade version's Stage 4 boss (original stage 3 boss was also a reused boss). Stage 4 has been split up into stages 4 and 5, with new bosses added. These resulting stages also contain a few extra sections. The final series of rooms leading to Wardner has also been changed significantly, with the home port having the double amount of rooms and differing obstacles in them. The final boss had a safe spot just in front of his knee, allowing to defeat him with no effort. This has been fixed by changing his attack pattern. Various other changes exists such as different hidden bonuses, etc. The graphical conversion left much to be desired. Parts of it, such as missing background details, world map and shop entrance graphics, can be explained by the small ROM size. Other changes however, appear to have been avoidable. Multiple stages have pig parts of the color palette unused (TODO attach Hivepal picture of stage 2 and 3 palette). All enemies aside from the floating skulls draw their colors from this limited pool. Color positions were swapped for unknown reasons, so that objects in the background appear brighter than in the foreground. (TODO attach picture of stage 1 wine and stage 3 bird statue).